Positive Computing: The Apple Watch is Out, but Does it Deserve to Exist? The Apple Watch is Out, but Does it Deserve to Exist? Just two years ago, Apple's media message shined the spotlight on emotional experience. "That's what matters" they said, and linked their values to "enhancing life" and making a better world. It seemed to me that Apple just might be trailblazing a commercial path towards positive computing. If psychological wellbeing really was on the horizon for Apple, the new Apple Watch campaign proves they've taken a major detour, and backward down the thoroughly well-worn path of materialism and productivity. In 2013, an Apple advertisement suggested we ask of new technology whether it "deserves to exist". The question was voiced over a montage of people in the midst of emotionally fulfilling moments in life. The message seemed to be that if a technology wasn't improving meaningful experience in human lives then it didn't deserve to exist. In the same year, the developer's conference debuted an elegant (and dare I say profound) animated sequence that placed emotional experience at the center of Apple's design intention and value proposition. Remember this? The first thing we ask is, what do we want people to feel? Then, last year we were invited to celebrate design "that lifts up humanity, breaks down our barriers and heals the landscape." So is it any surprise that I should be disappointed when the 2015 event opened on beauty shots of an Apple retail store flooded by new Chinese customers marveling at gadgets? a message clearly about lusting after stuff, not meaningful experience? The reliably well-produced opener (a tribute to consumerism) was followed by Tim Cook pointing out that "full" is how he likes to see Apple stores. Not a terribly inspiring start. So we're not making the world a better place this year then? While the research kit promises to be a valuable contribution to medical research (and if you do research, I suggest you check it out), it's the new Watch everyone was waiting for. The key messages surrounding the Apple watch were unambiguous: Personalization ("the most personal product we've ever made") and Status (look to the 18 karat gold edition with the $17,000 price tag, "more than someone in the US on minimum wage makes in a year" as an article in the Guardian pointed out). The watch's position as a high-end fashion accessory was brought home by the controversial inclusion of top model Christy Turlington Burns (and Cook made sure to give her the opportunity to say she had more than one Apple watch for varied occasions). With regard to meaning, wellbeing, or fulfilling experience, I'm afraid we got only the borrowed variety. Turlington Burns is not just a model, she also dedicates to maternal health causes. That has nothing to do with the watch, but it allows for a convenient cognitive juxtaposition. Turlington's humanitarian work is genuine and I felt as if they were hijacking it as a way to wrap up status and materialism in good intentions. I would have been better wooed if the watch had anything at all to do with supporting Turlington's humanitarian work in some way, rather than just being a great "fitness companion" on a run that was kinda maybe related to her humanitarian work. For instance, what if it had allowed her to connect to those she was helping, to others sponsoring or joining her on her journey, or to visualizations of the meaning and deeper motivations behind the activity (live births by the minute? notes of encouragement from friends? evidence of impact? My specific ideas may be rubbish but you catch my drift). In other words, what if the watch made something possible that wasn't possible before and that thing contributed to individual or societal wellbeing? It didn't. During the video of Turlington's marathon in Africa, she says (presumably scripted) that the watch is her motivation. But of course it isn't. She started her work long before the watch existed and presumably it's altruism that motivates her. 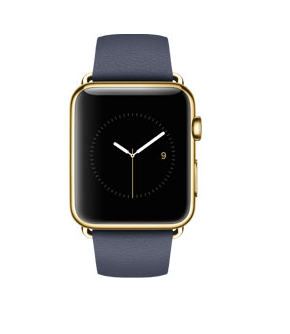 It's as if Apple were trying to get you to confuse the two: buying their watch, and doing good. But what about the "new ways to connect" you say? Sure, the ability to send someone a cartoon of your beating heart is neat, but is it really that qualitatively different than an intimate text message or the "143" of beeper days (if you catch the beeper reference you know how old you are). Combined with glued-to-your-wrist always-on email, tweets, live news, sports scores, and notifications, I'm thinking the Apple watch is better for long distance relationships than for close ones. Go on, call me a dreamer. You might say that expecting a multi-billion dollar for-profit business to not encourage materialism would make me a dreamer. But I'm not the only one. And maybe I just thought that if one of the big tech companies was going to think different, it just might be Apple. Especially after their previous spotlight on emotional experience. If not them, who? If not now, when? It looks like I'll have to look elsewhere for the next trailblazers in Positive Computing and truly human-centered design, at least for the moment. Any takers?